Remember the "gingham giveaway" last week? Well, while we were getting ready to leave the dinner, I saw the cute girl in this adorable gingham dress. So of course I had to take a picture (with her permission, of course). She even has a crinoline! She told me it was a "Betty Jane" dress. I googled it and I came up with something in Australia. My sweet husband sent me this email. The next night we went for homemade ice cream and blackberries at my cousin's house. Cathy and her husband, Terry, just celebrated their 40th anniversary. And like me, Cathy is from California. And like Mark, Terry is from Minnesota. The combination seems to be working well for both of us! Terry was making ice cream with a steam-powered ice cream maker. Isn't this cool? I was a cake server at their wedding. Cathy had a photo album, so this is a photo of a photo. I'm on the right, second in from the end. I guess serving cake is a serious job...Cathy didn't know this--I just told her the other night--but when I was lighting candles, my hair caught on fire. I was able to quickly get it out, but was it ever smelly! And our dear friends, Valerie and Matt, got married over the weekend. Many happy wishes as you begin your new life together! Remember this tree from last week? OPI nailpolish (my favorite) has a special edition, Minnie Mouse! The one on the left has pink glitter in the shape of hearts. I love seeing life through your eyes, Cindy. Congratulations on your anniversary! Looks like you had a great anniversary celebration with lots of fun! Love seeing THE tree before and after. It's always fun seeing your postcards too. I still need to learn how to do that. Happy anniversary. 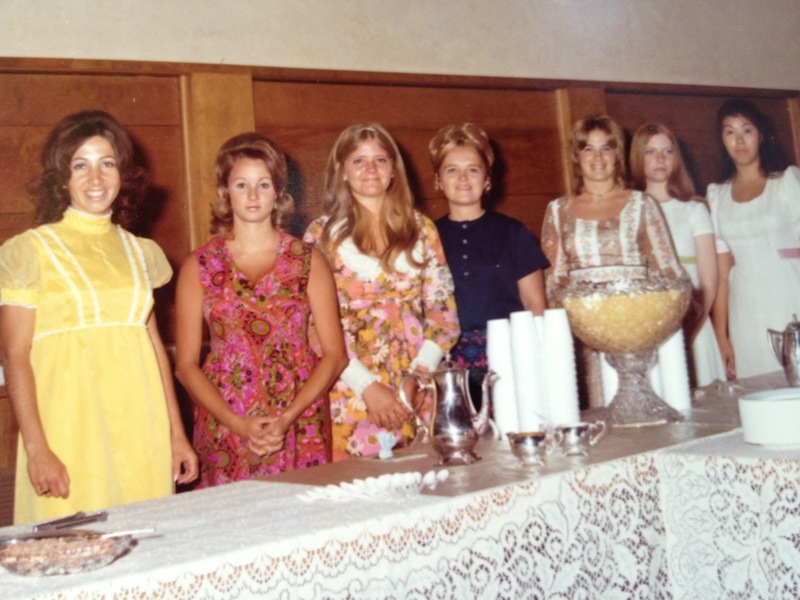 great trip down memory lane with those 70s dresses! Loving the random postings!!! Happy anniversary. What a fun post congratulations on a fabulous fun week. Happy anniversary, and happy sewing. Got to chase down that nail polish--too fabulous! I am absolutely loving the retro cake-serving look! Love a porsche boxster! We had a white one and I was the first one to get the speeding ticket! Looks like you've had lots of fun lately - Happy Anniversary! Yes, I recall that cutting the cake was very serious business in those days! Now, the caterer does it. I sure want to see you in those orange shoes!! Have a very wonderful weekend sewing, Cindy. Your really random posts are a hoot. Gabriel's before and after hair shots made me snort!! Love the Don King before! 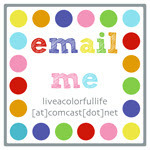 You and Mark are more adorable every day I get to know you - love that email he send!! Happy Anniversary to you both. 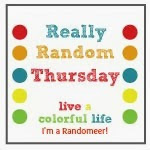 Oh, do I love your random posts! I never know what to comment on first... I think baby hair trumps everything, though. Man, that is one cute babe! the happy anniversary email from Mark is soooo sweet! Happy anniversary! I love that email! What a guy! I'm catching up on your blog. Starting here and working my way up the line. I'll apologize in advance for inundating you with comments. I think I need all that OPI polish. What great colors and fun!